Rhetorical Grammar encourages writers to recognize and use the grammatical and stylistic choices available to them and to understand the rhetorical effects those choices can have on their readers. Rhetorical Grammar is a writer's grammar - a text that presents grammar as a rhetorical tool, avoiding the do's and don'ts so long associated with the study of grammar. It reveals to student writers the system of grammar that they know subconsciously and encourages them to use that knowledge to understand their choices as writers and the effects of those choices on their readers. 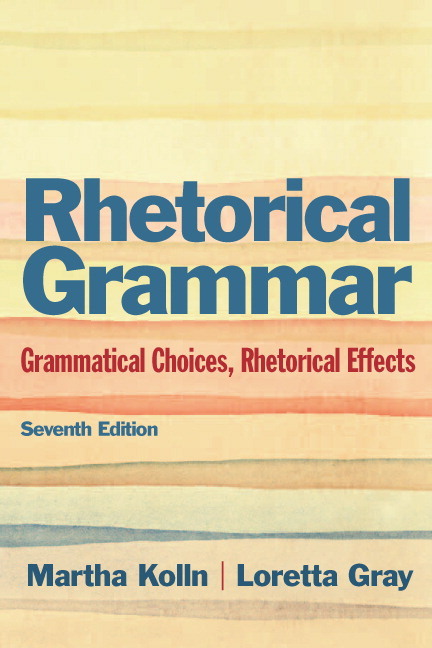 Besides providing key strategies for revision, Rhetorical Grammar presents systematic discussions of reader expectation, sentence rhythm and cohesion, subordination and coordination, punctuation, modification, diction, and other principles. Studying grammar from this rhetorical point of view defines the study of language as an intellectual exercise designed to open up students' minds to the versatility, beauty, and possibilities of language. Chapter 2 on sentence structure and patterns uses information based on students' own language expertise to boost their confidence in their language ability and help them make sense of punctuation. Numerous professional samples throughout the chapters exemplify the topics under discussion and provide topics for class discussions. Chapter 13 offers a discussion and glossary of punctuation, providing a rationale for punctuation and illustrating available punctuation options and their effects. Discussion of "the missing pronoun" in Chapter 12 explains the sources of sexism in language and teaches reasonable alternatives. Chapter summaries list rhetorical and punctuation reminders for easy reference. In-chapter exercises and discussion questions are useful for in-class and small group activities and for peer editing. Answers provided for odd-numbered exercises allow for self-teaching. testing whether those objectives have been achieved. are conducive for use in online courses. • One-third of all exercises are new; others have been revised. • Clarified discussions of concepts and updated examples.